Cathal Póirtéir and Mick Blanch, Irish Famine Walk 2015. On day three of the Famine walk, the walkers reached Ballynacarrigy, a village that was devastated by the Great Hunger as recalled in local folklore. One of Ireland’s most renowned folklorists, Cathal Póirtéir, is the author of Famine Echoes (Gill & Macmillan, 1995), the leading work in the field. I feel that the echoes of those silenced voices which we have in folk memory are the nearest we can get to the experience of the poor in the 1840s and 1850s. Survivors, as well as victims, suffered hunger, lost loved ones and neighbours, suffered the ignominy of the poorhouses and the dangers of the fever. Many of those who lived to tell the tale had witnessed the dying days of individuals, families, and communities who would otherwise have lived and perished without mention in official records. 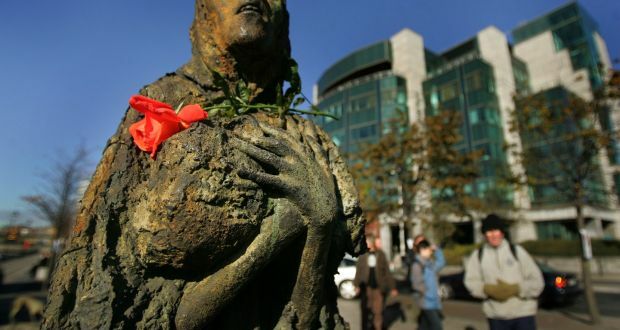 Some of the tradition bearers recorded by the expert collectors of the Irish Folklore Commission were people whose own families had been evicted, people who had buried the dead, received charity, worked on the relief schemes and existed on relief food. Others were those who benefitted from the Famine as their families increased their holdings by getting the land of those who died or emigrated. Many of these survivors of the Great Irish Famine lived into [the twentieth] century with a store of personal and communal memories of the bad times. Not everyone had the same story to tell. The memories and the telling of them varied from person to person and from place to place, depending on individual circumstance and experience. Undoubtedly, many memories and stories of the horrors of the Famine were suppressed consciously and unconsciously for a variety of reasons. Other elements were simply forgotten or reshaped with the passage of time. While we are not fortunate enough to have a written record from the ordinary people of the period, we are exceedingly fortunate in having a very rich and detailed source in the folk memory which was collected and preserved within one hundred years of the Famine (12-13).